A Nazirite (also spelled Nazarite) (from Hebrew: נזיר, nazir meaning "consecrated"), refers to Jews who consecrated their lives to God by taking ascetic vows requiring them to abstain from wine, refrain from cutting their hair, and avoid corpses, graves, and tombs (Numbers 6:1-21). Several famous Nazirites are described in the Bible including Samson and John the Baptist. Some scholars have even suggested that James the brother of Jesus (and perhaps Jesus himself), may have taken Nazirite vows thus giving rise to the term "Nazarene", which may be derived from the word "Nazirite" rather than "Nazareth". The Bible describes Nazirites being simultaneously "holy unto the Lord" (Numbers 6:8) but also needing to bring a sin offering to the Temple. This contradiction has led to divergent interpretations of the Nazirites among Talmudic authorities (see below). Any Jewish person could become a Nazirite by an intentional verbal declaration, including children. Today, a person can still become a Nazirite despite the fact that the Temple in Jerusalem is no longer standing; however, without the Temple there is no way to bring the required sin offering to end the Nazirite period. Therefore, anyone becoming a Nazirite today would de facto become a permanent Nazirite until death. The term "Nazirite" comes from the Hebrew nazir meaning "consecrated" or "separated". A variant translation of the term renders it as "crowned." Halakha (Jewish Law) has a rich tradition on the laws about the Nazirite. These laws were first recorded in the Mishnah, and Talmud (in tractate Nazir). They were later codified by Maimonides in the Mishneh Torah (Hafla'ah, Nazir). From the perspective of Orthodox Judaism these laws are not an historical footnote but can be practiced even today. However, since there is no Temple of Jerusalem to complete the vow, and any vow would be permanent, modern rabbinical authorities strongly discourage the practice to the point where it is almost unheard of today. The standard rules surrounding legal vows in Judaism also apply to the Nazirite vow. Thus, a father has the ability to annul the nazirite vow of his young daughter, and a husband has the ability to annul a vow by his wife, when they first hear about it (Numbers 30). Likewise all of the laws related to intent and conditional vows apply also to nazirite vows. If a nazirite fails in fulfilling these three obligations there may be consequences. All or part of the person's time as a nazirite may need to be repeated. Furthermore, the person may be obligated to bring sacrifices, and, in certain circumstances, suffer a penalty of lashes. Avoid corpses and graves, even those of family members, and any structure which contains such. It is also forbidden for the Nazirite to have grape, or grape derivatives even if they are not alcoholic. According to Rabbinical interpretation there is no prohibition for the nazirite to drink alcoholic beverages not derived from grapes. According to non-Rabbinical interpretation, a Nazirite is forbidden to consume any alcohol, and vinegar from such alcohol, regardless of its source. The laws of wine or grapes mixing in other food is similar to other dietary laws that apply to all Jews. A nazirite can groom his hair with his hand or scratch his head and needn’t be concerned if some hair falls out. However a nazirite cannot comb his hair since it is a near certainty to pull out some hair. A nazirite is not allowed to use a chemical depilatory that will remove hair. A nazirite that recovers from Tzaraath, a skin disease described in Leviticus 14, is obligated to cut his hair despite being a nazirite. The nazirite (except for a Samson-like nazirite as stated above) may not become ritually impure by a dead body. This includes not being under the same roof as a corpse. However a nazirite can contract other kinds of ritual impurity. A nazirite that finds an unburied corpse is obligated to bury it, even though he will become defiled in the process. At the end of the nazirite period the nazirite brings three sacrifices in the Temple of Jerusalem. The first is a ewe for a chatat (sin offering), the second is lamb for an olah (elevation offering), and finally a ram as a shelamim (peace offering) along with a basket of matzah and their grain and drink offerings. After bringing the sacrifices the nazirite shaves his or her head in the outer courtyard of the Temple. In general there were three types of Nazirites:1) A nazirite for a set time, 2) A permanent nazirite, and 3) A nazirite, like Samson, who was a permanent Nazirite and is not enjoined to avoid corpses. These types of Nazirites have no source in the Bible but are known through tradition. Each one of these types had slightly different laws. For example, a permanent Nazirite was allowed to cut his hair once a year if the hair was bothersome. After following these requirements for a designated period of time (which would be specified in the individual's vow, and not to be less than 30 days), the person would immerse in a Mikvah and make three offerings, a lamb as a burnt offering"(olah), a ewe as a Sin-offering (hatat), and a ram as a peace offering (shelamim), in addition to a basket of unleavened bread, grain offerings and drink offerings, which accompanied the peace offering. A person can specify the duration for any amount of days greater than or equal to 30 days. If a person does not specify, or specifies a time less than 30 days, the vow is for 30 days. A person who says "I am a Nazirite forever" or "I am a nazirite for all my life" is a permanent nazirite and slightly different laws apply. Likewise if a person says "I am a nazirite like Samson," the laws of a Samson-like Nazirite apply. However if a person says that he is a Nazirite for a thousand years, he is a regular Nazirite. A father, but not a mother, can declare his son, but not his daughter, a Nazirite. However the child or any close family member has a right to refuse this status. Two examples of Nazirites in the Hebrew Bible are Samson (Book of Judges 13:6-7), and Samuel (1 Samuel 1:11). 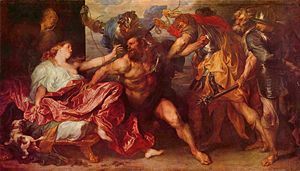 In both cases, their mothers made the vows before they were born, which required them to live an ascetic life, yet in return they received extraordinary gifts: Samson possessed strength and ability in physical battle, while Samuel was a prophet. 6. And the woman came and said to her husband, saying, "A man of God came to me, and his appearance was like the appearance of an angel of God, very awesome; and I did not ask him from where he was and his name he did not tell me. 11. And I raised up some of your sons as prophets and some of your young men as nazirites; is this not so, O children of Israel? says the Lord. 12. And you gave the nazirites to drink wine, and you commanded the prophets saying, "Do not prophesy." According to the Catholic Encyclopedia, "Nazarites appear in New Testament times … Foremost among them is generally reckoned John the Baptist, of whom the angel announced that he should "drink no wine nor strong drink." He is not explicitly called a Nazarite, nor is there any mention of the unshaven hair, but the severe austerity of his life agrees with the supposed asceticism of the Nazarites." The Gospel of Luke notes that wine was forbidden in ascetic practice, for the angel that announces the birth of John the Baptist foretells that "he shall be great in the sight of the Lord, and shall drink neither wine nor strong drink; and he shall be filled with the Holy Ghost, even from his mother's womb," in other words, a nazirite from birth, the implication being that John had taken a lifelong nazirite vow. The practice of a Nazirite vow is part of the ambiguity of the Greek term "Nazarene" that appears in the New Testament; the sacrifice of a lamb and the offering of bread does suggest a relationship with Christian symbolism (then again, these are the two most frequent offerings prescribed in Leviticus, so no definitive conclusions can be drawn). While a saying in (Matthew 11:18-19 and Luke 7:33-35) attributed to Jesus makes it doubtful that he was a Nazirite during his ministry, the verse ends with the curious statement, "But wisdom is justified of all her children." The advocation of the ritual consumption of wine as part of the Eucharist, the tevilah in Mark 14:22-25 indicated he kept this aspect of the Nazirite vow when Jesus said, "Verily I say unto you, I will drink no more of the fruit of the vine, until that day that I drink it new in the kingdom of God." The ritual with which Jesus commenced his ministry (recorded via Greek as "Baptism") and his vow in Mark 14:25 and Luke 22:15-18 at the end of his ministry, do respectively reflect the final and initial steps (purification by immersion in water and abstaining from wine) inherent in a nazirite vow. The biblical book, Acts of the Apostles is also attributed to the author Luke, and in Acts 18:18, Paul cut off his hair because of a vow he had taken and in Acts 21:20-24 Paul was advised to avoid the hostility of the "Jews there are which believe" (believe in Jesus, i.e. the Jewish Christians) in Jerusalem who had heard Paul taught against the law by purifying himself and accompanying four men to the temple who had taken nazaritic vows (so that he might appear "orderly"), a stratagem that only delayed the inevitable mob assault on him. This event brought about the accusation in Acts 24:5-18 that Paul was the "ringleader of the sect of the Nazarenes," and thus provides further verification that the term Nazarene was a mistranslation of the term Nazirite. What is curious is that Luke does not here mention the apostle James the Just as taking nazirite vows, although later Christian historians (e.g. Epiphanius Panarion 29.4) believed he had, and the vow of a nazirite would explain the asceticism Eusebius of Caesarea ascribed to James (Historia Ecclesiastica 2.23), an asceticism that gave James the title "James the Just." Nazirite vows do not appear to have been understood by the Gentiles, nor are they even mentioned in patristic writings; therefore, some look to "nazirite" rather than "of Nazareth" or "the Nazarene" for the origin of these Hebrew/Aramaic epithets for Jesus. This conclusion is based in part on the prophecy in Matt. 2:23 that says of Jesus, "And he came and dwelt in a city called Nazareth: that it might be fulfilled which was spoken by the prophets, He shall be called a Nazarene." It is doubtful that the prophets had actually said 'Nazarene', rather than 'Nazirite', because reference bibles state that the prophecy cited in Matt. 2:23 is in reference to Judges 13:5-7 concerning Samson's description as "a Nazirite to God from the womb to the day of his death." In addition, there is no word translated ‘Nazarene’ or any reference to a city of 'Nazareth' in the Hebrew Scriptures (Old Testament). Furthermore, although Luke 1:13-15:49 describes John the Baptist as a Nazirite from birth, John implied that Jesus was holier than he in Matt. 3:13-15:49, which says, "Then cometh Jesus from Galilee to Jordan unto John, to be baptized of him. But John forbad him, saying, I have need to be baptized of thee, and comest thou to me? And Jesus answering said unto him, Suffer it to be so now: for thus it becometh us to fulfil all righteousness. Then he suffered him." Thus Jesus was baptized, immersion in water being a fulfillment of the nazirite vow. The nazirite is called "holy unto the Lord" (Numbers 6:8), but at the same time must bring a sin-offering (Numbers 6:11) to make atonement for that which he sinned." This apparent contradiction, pointed out in the Babylonian Talmud, lead to two divergent views. Samuel and Rabbi Eliezer Hakappar, focusing on the sin-offering of the nazirite, regarded nazirites, as well as anyone who fasted when not obligated to, or took any vow whatsoever, as a sinner. However, another Rabbi Eliezer explains that the nazirite is indeed holy and the sin referred to in the verse applies only to a nazirite who became ritually defiled. Maimonides, following the view of Rabbi Eliezer Hakappar, calls a nazirite a sinner, explaining that a person should always be moderate in his actions and not be to any extreme. Nevertheless, he does point out that a nazirite can be evil or righteous depending on the circumstances. Nahmanides, in his commentary on the Torah, sides with Rabbi Eliezer. He explains that ideally the person should be a nazirite his whole life. Therefore ceasing to be nazirite requires a sin-offering. Many later opinions compromise between these views and explain that a nazirite is both good and bad. Rabbi David Cohen (1887–1972) was a nazirite. ↑ See Abraham ibn Ezra's biblical commentary. ↑ Mendy Hecht[http://www.askmoses.com/article.html?h=267&o=232 "What is a nazir?" Ask Moses. accessdate 2007-08-09. ↑ Catholic Encyclopedia: Nazarite: Retrieved November 3, 2007. ↑ Bauer lexicon, 2nd ed., 1979; Complete Gospels, Robert J. Miller, editor, 1992, translation note to Matthew 2:23, page 62: "Nazorean: This quote may be dependent upon the Septuagint of Judg 13:5 or 16:17. Matthew's spelling of the word differs from Mark's "Nazarene" (e.g., 1:24)." ↑ Catholic Encyclopedia: Nazarite: "From Acts (xxi, 23 sqq.) we learn that the early Jewish Christians occasionally took the temporary Nazarite vow, and it is probable that the vow of St. Paul mentioned in Acts 18:18, was of a similar nature, although the shaving of his head in Cenchræ, outside of Palestine, was not in conformity with the rules laid down in the sixth chapter of Numbers, nor with the interpretation of them by the Rabbinical schools of that period. (See Eaton in Hastings, Dict. of the Bible, s. v. Nazarites.) If we are to believe the legend of Hegesippus quoted by Eusebius ("Hist. Eccl.," II, xxiii), St. James the Less, Bishop of Jerusalem, was a Nazarite, and performed with rigorous exactness all the ascetic practices enjoined by that rule of life. "Retrieved November 3, 2007. ↑ McGarvey: "It is evident, from the transaction before us, as observed above, that James and the brethren in Jerusalem regarded the offering of sacrifices as at least innocent; for they approved the course of the four Nazarites, and urged Paul to join with them in the service, though it required them to offer sacrifices, and even sin-offerings. They could not, indeed, very well avoid this opinion, since they admitted the continued authority of the Mosaic law. Though disagreeing with them as to the ground of their opinion, as in reference to the other customs, Paul evidently admitted the opinion itself, for he adopted their advice, and paid the expense of the sacrifices which the four Nazarites offered. "Retrieved November 3, 2007. ↑ Catholic Encyclopedia: Judaizers notes: "Paul, on the other hand, not only did not object to the observance of the Mosaic Law, as long as it did not interfere with the liberty of the Gentiles, but he conformed to its prescriptions when occasion required (1 Corinthians 9:20). Thus he shortly after [the Council of Jerusalem] circumcised Timothy (Acts 16:1-3), and he was in the very act of observing the Mosaic ritual when he was arrested at Jerusalem (Acts 21:26 sqq.). "Retrieved November 3, 2007. ↑ Talmud, Taanis 11a Tosafot "Samuel says…"
Chepey, S. Nazirites in Late Second Temple Judaism: A Survey of Ancient Jewish Writings, the New Testament, Archaeological Evidence, and other Writings from Late Antiquity. AJEC 60. Leiden: Brill Academic Publishers, 2005. Moran, Michael L. '"Nazirites and Nazarenes: The Meaning of Nazaraeus in Saint Jerome." Zeitschrift für Antikes Christentum. Vol. 9 No. 2 (May 2006): 320-366. This page was last modified on 14 November 2018, at 16:10.